Don't you HATE when you read a post and you get all excited about the event you are reading about, or the item they are featuring only to find out that the event is OVER (they are posting after the fact) or the item is discontinue. It's like a poke in the eye, a metaphorical middle finger to us the readers, why oh why do this???? With that said, Country Living Magazine is having a Fair (of sorts you could call it, they are calling it) in Austin, TX (a couple other cities, check the above website for locations). Early bird (early buy) $40.00, from 8:30a.m.-10:00a.m. only available in advance and limited to 2500 tickets. That's 90 minutes before the crowds. They will have over 150 vendors with everything from art, antiques, crafts, furniture, home decor and more. The fair will also host seminars, how to's and demonstrations. At the Country Living Fair doing a talk and signing their cookbook, The Beekman 1802 Heirloom Cookbook will be Brent Ridge, M.D. 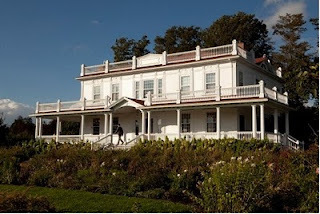 (half of the Beekman 1802 Boys and shown in the picture on the right, Josh Kilmer-Purcell is on the left). We (my daughter and I ) have meet both Brent and Josh twice before, and she and my mom went last year to Sharon Springs, NY to their home and the Sharon Spring Harvest Festival. My daughter wanted to meet the Beekman Boys (Josh and Brent) for her 13th birthday. How exciting is that, she wanted to meet the Beekman's and an English saddle. She got both, and Josh and Brent sent her a birthday card, signed her copy of their book and she made her trip to meet them. I could not have been happier, how many 13 year old girls are picking the Beekman's over Justin Bieber. Josh and Brent are incredible and she knows it. They are the cutest most fashionable farmers, with goats and great attitudes. They make goat milk soap, cheese, have a great cookbook and a llama (Polka Spots). Now, I love Josh and Brent, everything about them, EXCEPT Polka Spots, and only because my daughter LOVES Josh and Brent so much she had to have a goat (which turned into two, then zero, that's a horrible story that involves heavy machinery) and guess what she reallllllllllllllllllllllllllllllllllllllllllllllllllllllllly needed a llama like Josh and Brent. Two llamas are on there way, and I think a pig ( did I mention they get a pig to raise and slaughter). Don't forget we have like a dozen horses seriously I stopped counting, I can't even keep all the names straight any more. I guess I should send Josh and Brent a big Texas thank you note for the positive influence, my daughter loves the animals and the farm and the way that they highlighted that on the show. It could be worse, all I need to do now is get a copy of "Llama's for Dummies" wait I might need "Goats for Dummies" too! If you are a fan of Beekman 1802, PLEASE do not tell Farmer John we have had a horrible goat disaster, he is sensitive and sweet and and I could not bear to think we made him cry. Oh, before you ask, YES, she knows they are a couple, if you have a problem with it, send your comments to the Texas Legislature. We love them and are SOOOOOOOO happy they can legally get married that we can't wait to send them a wedding present as big as Texas. Love IT. Brent and Josh - so adorable, fashionable, talented and we LOVE the boots. Buy their cookbook - The Beekman 1802 Heirloom Cookbook at the Country Living Fair and have it signed by Brent. Today's post was not funny or witty but it did give y'all a little something to possibly do in two weeks, and I don't want to sound like I'm bitching all the time. Plus we love THE BEEKMAN BOYS (Josh and Brent). If you'll be heading to the Country Living Fair giving me shout, I'll be there the 28th. I just read that last sentence again, what a big dork I sound like, I'll be there the 28th. Yes, I will with thousands of other people, walking around minding my own business doing nothing of any importance or exciting to anyone but me and my daughter. Make plans now, go, have fun, buy a cookbook and meet Brent, shop. Enjoy the day. I've made the 8 minute Galette, it's yummy!!!! Hey there! Thank you so much for stopping by my blog! You are hilarious btw! I love your closet it's amazing, and I am going to pass on your lotion recipe to my mother in law! Very helpful thank you! I love reading what you have to say! I hope you have an incredibly blessed day and I look forward to reading more! I can't wait to go!! And, I can't wait to get a cookbook. 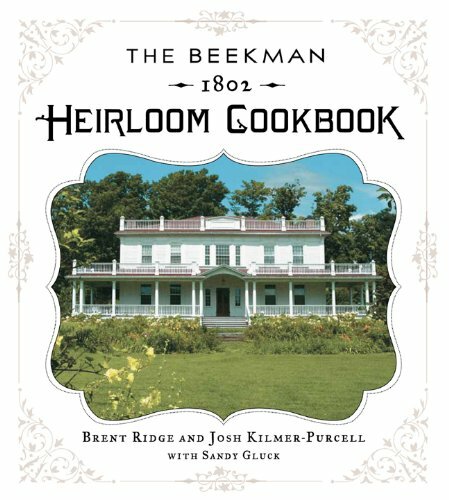 I had no idea who The Beekman boys were but, now I do thanks to you! Sounds like it's going to be a fun weekend! See ya there.. Thanks for the scoop! I know what you mean about blogs that don't like to share details. It's nice to have the info BEFORE the event happens. That sounds like so much fun! 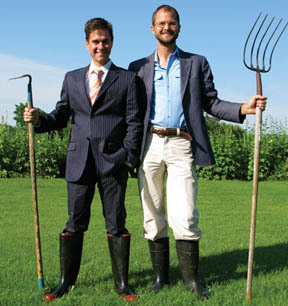 I've seen the Beekman boys once on TV, and I think they're so funny!